There is a plethora of research on the benefits of having a mentored relationship with a professor and being engaged together in an independent scholarly or creative project. To be sure HPU students are experiencing those same benefits as the literature indicates we need to assess the experiences of our students. This is an assessment survey about your skill sets and experience with research or creative works at the start of your project. Please complete this form only after you registered your project on the Mentee Registry. We will follow up with similar questions at the end of your project so we have data on how the experience of doing mentored work impacted your undergraduate experience. Please be as honest as you can about your skills. You are not expected to come into the experience with experience. If you have more than one major, please select the major that reflects your mentored project. The project topic is how we will we will identify your research over time. If you have more than one project on a related topic, please make sure the topic reflects some difference so we can differentiate your projects. Please answer the first two questions on a 5 point scale where 5 is the highest rating and 1 is the lowest score. Please answer the following questions on a 5 point scale where 5 means Always and 1 is Never. There is also the option to say the question does not apply to you (N/A). Shows understanding of important current individuals within the discipline. List professional communities or societies you have joined. Please share an explanation for your level of confidence and/or other comments about how confident you are. These last open questions are optional! We do hope you will take a few minutes to answer them. But please be brief. We do not expect long responses to any of these questions. There are also no right or wrong answers. Our purpose to to understand your expectations, interests, and concerns when starting this endeavor. Why did you decide to do an undergraduate mentored project? How did you decide on your project? what ideas, people, literature and/or academic experience informed your decision? Discuss briefly what you know about the research or creative process, what you are uncertain about, and what you think you have left to learn. What strengths do you bring to this project and what uncertainties, if any, do you have about undertaking this project? How do you see your faculty mentor's role and your own role in the project? H0w might you assess the value of your research project if the outcome is not what you expected, the outcome is ambiguous, or you were unable to realize your project goal? Please describe your current academic and work career plans. How do you expect this project to be relevant to those plans? In thinking about taking on this project, do you have concerns? What concerns you the most? 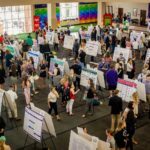 Andrea Baellow, an athletic training major, shares her experiences performing undergraduate research on the relation of the hip to ACL injuries and their prevalence in younger females. 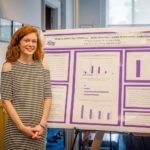 Her experiential education at High Point University was supported by the state of the art Human Biomechanics & Physiology Lab, where she could apply what she has learned with hands-on experience.